Timing divergence events allow us to infer the conditions under which biodiversity has evolved and gain important insights into the mechanisms driving evolution. Cichlid fishes are a model system for studying speciation and adaptive radiation, yet, we have lacked reliable timescales for their evolution. Phylogenetic reconstructions are consistent with cichlid origins prior to Gondwanan landmass fragmentation 121-165 MYA, considerably earlier than the first known fossil cichlids (Eocene). 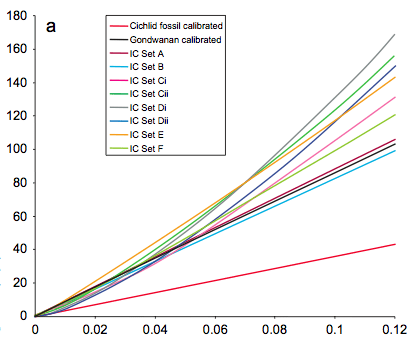 We examined the timing of cichlid evolution using a relaxed molecular clock calibrated with geological estimates for the ages of 1) Gondwanan fragmentation and 2) cichlid fossils. Timescales of cichlid evolution derived from fossil-dated phylogenies of other bony fishes most closely matched those suggested by Gondwanan breakup calibrations, suggesting the Eocene origins and marine dispersal implied by the cichlid fossil record may be due to its incompleteness. Using Gondwanan calibrations, we found accumulation of genetic diversity within the radiating lineages of the African Lakes Malawi, Victoria and Barombi Mbo, and Palaeolake Makgadikgadi began around or after the time of lake basin formation. These calibrations also suggest Lake Tanganyika was colonized independently by the major radiating cichlid tribes that then began to accumulate genetic diversity thereafter. These results contrast with the widely accepted theory that diversification into major lineages took place within the Tanganyika basin. Together, this evidence suggests that ancient lake habitats have played a key role in generating and maintaining diversity within radiating lineages and also that lakes may have captured preexisting cichlid diversity from multiple sources from which adaptive radiations have evolved.